The 6.0L Power Stroke was first introduced in 2003 as the eventual successor of the 7.3L Powerstroke. The engines ran alongside each other for a short time before the 6.0 became the only offering in 2004. This engine was produced by International and based on the International VT365 engine. The 6.0 Power Stroke engine is very similar to the VT365 with some exceptions in tuning and performance to meet Ford’s more specific light-duty application. 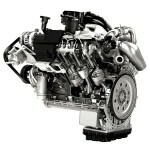 This engine was available in Ford Super Duty trucks as well as Ford Econoline vans. As mentioned, the 6.0L Power Stroke replaced the 7.3L Powerstroke, starting in 2003 and then fully by 2004. The 6.0L did provide about 50 horsepower more than the 7.3L, but the primary driver for the introduction of the new engine was to allow for compliance with increasingly stringent emissions regulations. 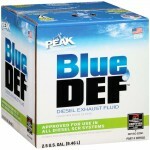 Significant modifications were made to the engine to allow the emissions standards to be met. For one, the 6.0 Powerstroke introduced emissions equipment in the form of exhaust gas recirculation (EGR) and a diesel oxidation catalyst (DOC). The EGR recirculates some of the exhaust gases to the intake which results in lower combustion temperatures which in turn reduces the NOx emissions created by the engine. The DOC is mounted on the exhaust lines, similar to a 3-way catalytic converter for gasoline engines. 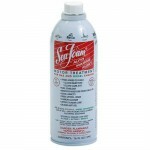 It aids by converting carbon monoxide to carbon dioxide and also oxidizes unburned hydrocarbons leaving the engine. The engine also introduced a higher pressure injection system to enable more precise control of the fuel injections, a very critical factor in emissions control. This engine also had a variable geometry turbocharger (VGT) equipped. A final significant change was the switch from a 2-valve OHV to a 4-valve OHV. 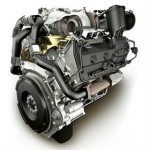 This engine was available in Ford trucks until 2007 but could be purchased for the Ford econoline applications until 2009. While there were many upgrades, this engine received a bad reputation, fair or not, for quality problems. This engine was less popular than its predecessor. 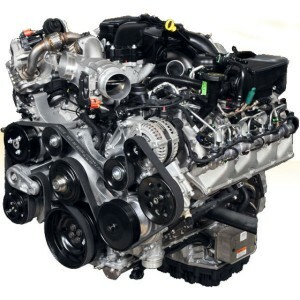 The 6.0 engine converts to 365 cubic inches in standard units. 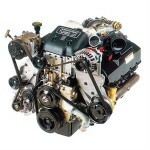 The displacement in cubic inches correlates to the International name for the engine, the VT365, with the VT indicating that the specific engine offered a variable turbo. The bore was 3.74 inches with a stroke of 4.134 inches. As already mentioned, despite this engine’s lower volume, it did provide more power than its predecessor. The peak torque was 570 [email protected] 2000 RPM. This torque level was reached in 2005, while the initial offerings for this engine provided 560 lb-ft at the same engine speed. The engine was able to reach 325 horsepower at 3300 RPM. The 6.0L Powerstroke used cast iron head and block. The engine was known to have some issues with blowing cylinder head gaskets. This is primarily attributed to the fact that there are only 4 cylinder head bolts per cylinder. The valvetrain for this engine was overhead valves, with 4 valves per cylinder. This means 2 intake and 2 exhaust valves per cylinder. These are driven by a standard push rod camshaft located in the block. 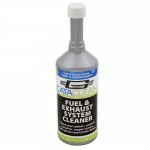 While the switch to the 6.0 may have not been desired by some, it was required in order to meet emissions standards. The 6.0 did offer a lot of improvements to previous models such as VGT, 4 valve OHV system, and improved fuel injection systems. There were also other emissions control devices added which contribute significantly to the complexity of the engine. Regardless of what is said, this engine was a step in the right direction towards the modern-day, much improved diesel engines.